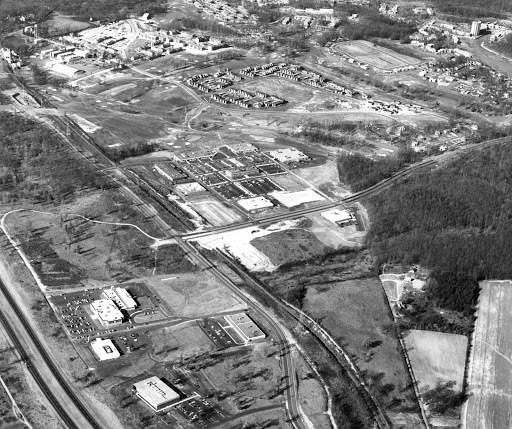 Near the center of the photo, you can see Wiehle Avenue dead-ending at the intersection with Sunset Hills, way short of the Dulles Access Road (bottom left corner), a pristine field and a couple of trees standing where parallelograms will soon rise. In the upper left, you can see the water tower for the 'ole distillery, which would continue turning out hooch for U.Va. frat boys for another decade or so. Almost at dead center is Isaac Newton Square, where the old RA headquarters building and the Ebola-tainted monkey lab proudly stood. A few other bomb-to-dolphin strapping outfits businesses are to the south of Sunset Hills in the lower left corner, while the townhouses of Golf Course Island (with an empty patch of land reserved for the Island Walk cooperative) are directly behind it. To its right, on the other side of Wiehle, is a stand of trees that would eventually become Tall Oaks. And if you squint and look in the upper right-hand corner, you can see Heron House and the rest of the Lake Anne Village Center, still surrounded by trees and whatnot, with the fields of Hook Road already carved out on the other side of the lake. But most thrillingly of all, if you look at the white scar of denuded land on the east side of Wiehle near the center of the photo, you can almost smell the grease from Reston's once and future home of fast-food goodness: the McTacoHut, the end. Shades of the day when I would bike or even drive over the then dirt WO&D right-of-way to get to work in More Desirable North Reston. Alternative was the traffic jam at the 2-lane bridge with two right-angle turns to cross at Reston Avenue. The tight turns seemed beyond the skill of most DC area drivers. Thus the jam-up. I was a delinquent in Herndon at the time. My brother and I would ride bumpety-bump-bump over the ties on the abandoned W&OD to Reston and then make our way down to Lake Anne, before it looked so dated and worn out. "To its right, on the other side of Wiehle, is a stand of trees that would eventually become Tall Oaks." And just to the north is a hallowed piece of ground inexplicably emanating Italian food smells. Let's just not let them move Macaroni Grill to Tall Oaks! Dawn raises a good point: If there was no Macaroni Grill, was it truly Reston? And if a tree near a stream falls by itself, is that a "stream restoration"? It was Reston, but it was Reston without a soul.